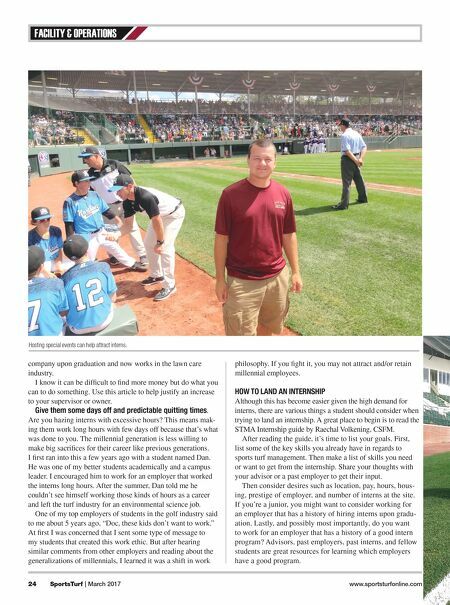 24 SportsTurf | March 2017 www.sportsturfonline.com FACILITY & OPERATIONS company upon graduation and now works in the lawn care industry. I know it can be difficult to find more money but do what you can to do something. Use this article to help justify an increase to your supervisor or owner. Give them some days off and predictable quitting times. Are you hazing interns with excessive hours? This means mak- ing them work long hours with few days off because that's what was done to you. The millennial generation is less willing to make big sacrifices for their career like previous generations. I first ran into this a few years ago with a student named Dan. He was one of my better students academically and a campus leader. I encouraged him to work for an employer that worked the interns long hours. After the summer, Dan told me he couldn't see himself working those kinds of hours as a career and left the turf industry for an environmental science job. One of my top employers of students in the golf industry said to me about 5 years ago, "Doc, these kids don't want to work." At first I was concerned that I sent some type of message to my students that created this work ethic. But after hearing similar comments from other employers and reading about the generalizations of millennials, I learned it was a shift in work philosophy. If you fight it, you may not attract and/or retain millennial employees. HOW TO LAND AN INTERNSHIP Although this has become easier given the high demand for interns, there are various things a student should consider when trying to land an internship. A great place to begin is to read the STMA Internship guide by Raechal Volkening, CSFM. After reading the guide, it's time to list your goals. 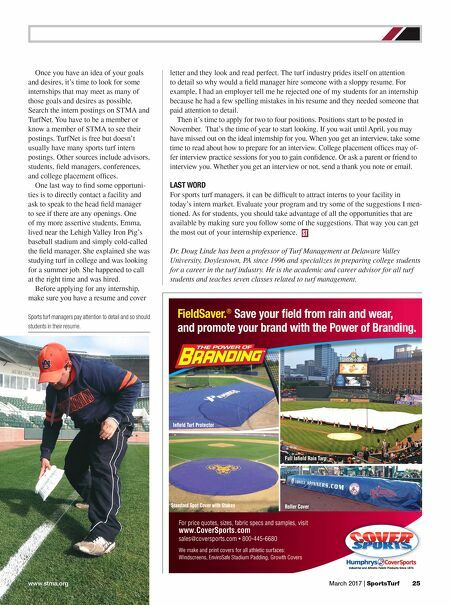 First, list some of the key skills you already have in regards to sports turf management. Then make a list of skills you need or want to get from the internship. Share your thoughts with your advisor or a past employer to get their input. Then consider desires such as location, pay, hours, hous- ing, prestige of employer, and number of interns at the site. If you're a junior, you might want to consider working for an employer that has a history of hiring interns upon gradu- ation. Lastly, and possibly most importantly, do you want to work for an employer that has a history of a good intern program? Advisors, past employers, past interns, and fellow students are great resources for learning which employers have a good program. Hosting special events can help attract interns.